Our Xenia Bezel Set Round Cubic Zirconia Pave X Eternity Band is a unique and stylish eternity band. The Xenia Band is the perfect gift for that special occasion. 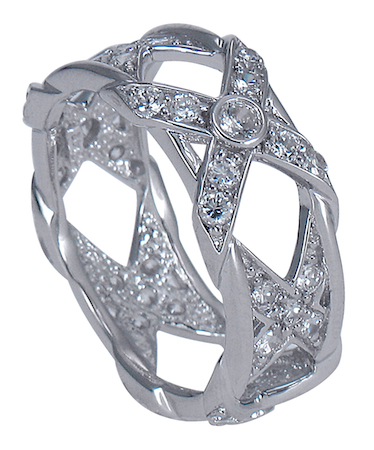 A weaved styling with sparkling cubic zirconia �X� designs are integrated all the way around the eternity style band. 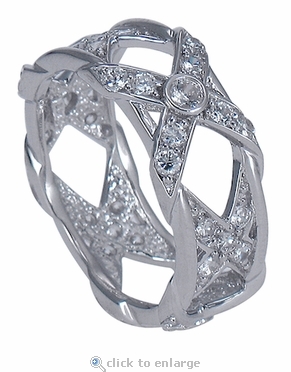 Multiple sizes of bezel set and pave set rounds highlight the band. The band measures approximately 8mm at its widest point and includes over 1.5 carats in total carat weight.